Since 1970, the FTSE All-Share Index has fallen in April in only nine years. This is quite remarkable, and not surprisingly makes April the strongest month of the year for equities. The average return for the index in the month since 1970 is 2.6%, again this is the best performance of any month of the year by quite a margin. Although in recent years, the market’s performance in April has not been so stellar. 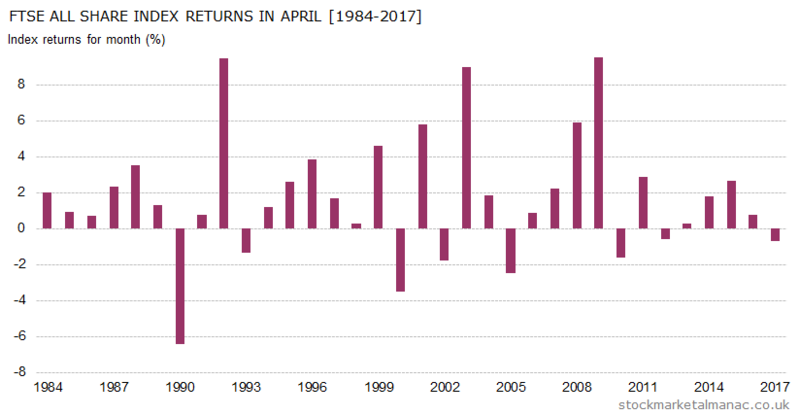 Since 2000, the average return of the FTSE All-Share Index in April has been 1.8%, with positive month returns seen in 12 of the last 18 years. And it might be noted that the market actually fell in April of last year. The FTSE 350 sectors that tend to be strong in April are: Industrial Engineering, General Retailers, and Oil & Gas Producers; while the weaker sectors are: Construction & Materials, Household Goods, and Media. At the stock level, the five FTSE 350 shares with the best April volatility-adjusted returns over the past ten years are: JD Sports Fashion [JD. ], Ashmore Group [ASHM], Renishaw [RSW], UDG Healthcare [UDG], and Weir Group [WEIR]. Just two FTSE 350 stocks have seen their shares rise in every April since 2007: JD Sports Fashion and Temple Bar Investment Trust. The FTSE 350 stocks with the weakest record in April have been: Balfour Beatty [BBY], BAE Systems [BA. ], RELX [REL], Booker Group [BOK], and Pearson [PSON]. Since 2007 the shares of Balfour Beatty and RELX have seen positive returns in April in only three years. This is the strongest month for the FTSE 100 relative to the S&P 500 (in sterling terms), the former out-performs the latter by an average of 1.3 percentage points in April ­ the UK index has out-performed the US index (in sterling terms) in April in 14 of the past 16 years. It’s Easter on 1st April so the LSE will be closed on the 2nd (Easter Monday). A famous anomaly in stock markets is that prices tend to be strong on the day preceding and the day following a holiday. This effect is strongest in the year around the Easter holiday. Further articles on the market in April. This entry was posted in April, Market, News and tagged month review by Almanacist. Bookmark the permalink.